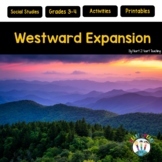 In this activity students use an interactive map website to learn about the territories gained during Westward Expansion. I used this as an in class activity but it can also be given for homework. 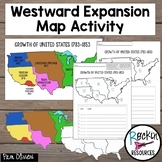 Have students analyze this Westward Expansion map and then use their knowledge of Social Studies and information from the map to answer the assessment questions. This map activity allows students to do research on their own to complete a multi-step worksheet. Incorporating geography, chronological categorizing, and political analysis, students will be challenged to use various skills. 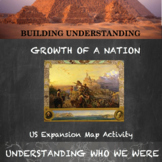 This is an activity that focuses on map skills within the context of Westward Expansion. Students review geographical locations within the United States (rivers, states, territories, etc.). 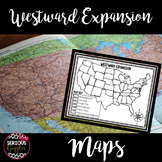 Students will complete a map that shows the progression of westward expansion across the United States. This provides a great visual images for students. 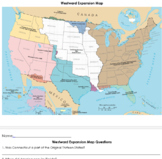 This activity/worksheet asks students to analyze a map of Westward Expansion in America. 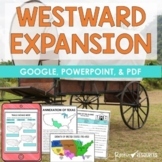 The resource gives a map of Westward Expansion in America, and 8 questions to go with the map. The questions increase in difficulty as they progress. This is a guided map activity to go along with westward expansion. The teacher provides an outline of the United States that the students use to complete the activity. COMPLETELY EDITABLE!!! For this project, students create a large flip book displaying colored portions of land the U.S. gained during the time period of Manifest Destiny. This project is useful during a Westward Expansion Unit when done step by step as each land acquisition is taught. 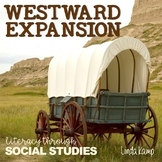 This Westward Expansion map aligns with SOL 6 for 11th grade.